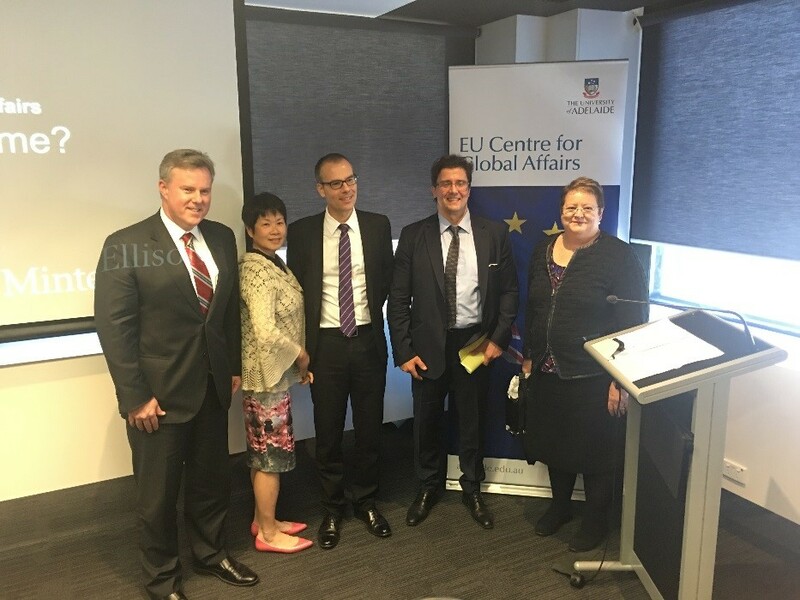 The EU Centre for Global Affairs hosted a luncheon Forum on Friday 28 October 2016 at the offices of Minter Ellison in Adelaide. Discussion focussed on differences in the legal approach in Australia and in the EU to geographic origin labelling and what this might mean for local South Australian food and beverage producers. As Ivano Casella, Counsellor and Head of the Economic and Trade Section of the EU Delegation to Australia and New Zealand put it: What is the best way of protecting Geographical Indications (GIs): a unique (sui generis) system as in the EU, or via trademark rules, as favoured in the US and proposed in the Trans-Pacific Partnership Agreement (TPP)? 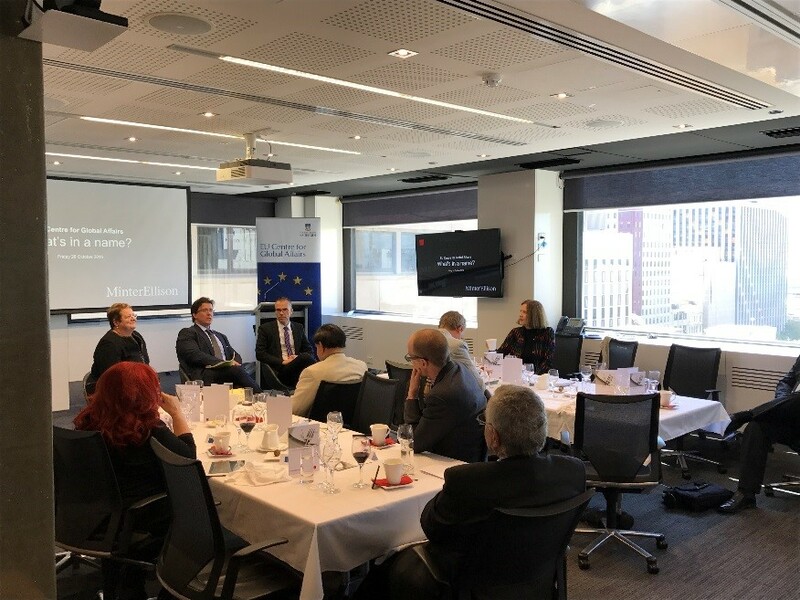 A key issue for discussion was how this matter might be handled in the forthcoming EU/Australia FTA negotiations, especially against the background of the recent push in the (TPP) negotiations in the direction of a trademark system. In the struggle for supremacy between two systems to protect geographical names, the key note international speaker Dr Danny Friedmann argued that the text negotiated in the TPP delivers a decisive push towards a trademark system, with implications not only for TPP members but also for their trade partners. While the WTO Agreement on Trade-related Aspects of Intellectual Property Rights (TRIPS) is agnostic in distinguishing between a sui generis or trademark system for the protection of geographical names, it also has elements, according to Dr Danny Friedmann, that can undermine the protection of generic GIs in the non-wine and spirits products categories. Mr. Ivano Casella drew attention to the difference between GIs and Trademarks, the benefits of using the GI system for consumers, society and producers and specific shortcomings associated with the use of the trademark system as an alternative. Ms Caroline McCarthy, Director in the Free Trade Division of the Australian Department of Foreign Affairs and Trade explained how geographical names are protected effectively in the Australian setting via the trademark system, and outlined Australia’s associated FTA practices. The lively open discussion was moderated by Jane Drake-Brockman, Director of the EU Centre for Global Affairs. Some participants noted the cost disadvantages and minimal likely commercial benefits for South Australian producers of moving to a sui generis legal system; others explored the implications of the TPPs push towards a ‘new world’ system to protect geographical names. This is an area of active research at the University of Adelaide, both in the Law School and the Global Food Studies Centre; the EU Centre for Global Affairs encourages supplementary blog contributions and anticipates a further public event on this topic during 2017. Copy of Dr Friedmann’s presentation is available HERE. Could TPP seal the fate of geographical indications? This entry was posted in News and tagged EU, EU Centre for Global Affairs, Geographical Indicators, TPP, Trademark. Bookmark the permalink.